Here's a great way for kids to learn about Pesach and have fun at the same time! 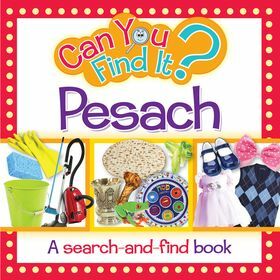 On each big, beautiful page, they can search and find objects connected to Pesach as they count from 1 to 10! Then, at the end, they can take The Afikomen Challenge"! Learning and enjoyment for kids ages 3 to 7!